Made of paper with a special texture that draws colors in and blends them into interesting patterns and swirls. Includes 50 each of 4 styles of leaves. Perfect for use with our Color Splash!® Liquid Watercolor. Pack of 200. Great to use with residnets and those with limited movement in their hands. This was used in a recreation group in a geriatric psych facility and was a very successful activity. Great for seasonal orientation with dementia patients. They need assistance as would young children but were able to stay occupied and were happy to see the end results hanging in our group room as fall decorations! I would buy this product again and will be purchasing the color diffusion papers for other activities in the future! 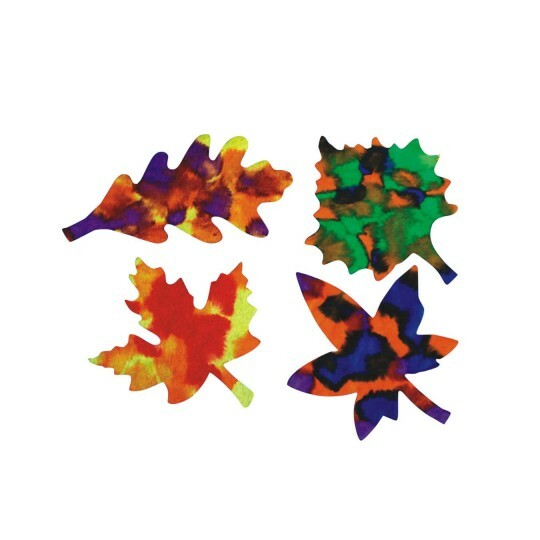 We used the leaves as a class project with water-soluble markers. It was easy for even the smaller children to draw designs and then add water to see the color spread. For the older students we included lessons about color-mixing and permeability.